What is this press? How can I identify the exact model and age of the press? I do not see a serial number on the chase bed, not sure if there could be one elsewhere. That’s an original George Phineas Gordon — most of the “knock-offs” you see were made by other companies after Gordon’s patents expired. I don’t know if Gordon put serial numbers on his presses, though I suspect he did. His draftsman, Frederick Degener, marked his Liberty on the shaft on which the large gear is mounted - you could look there. This is likely not the original treadle I assume? Is there a date range for the press, or any way to narrow it down? Why not the original treadle? 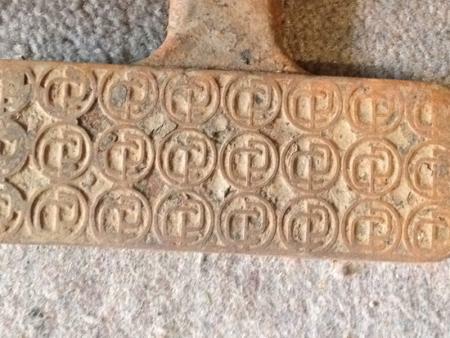 It looks like the design is a monogram of Gordon’s initials, though a close-up photo of that surface would be very interesting. 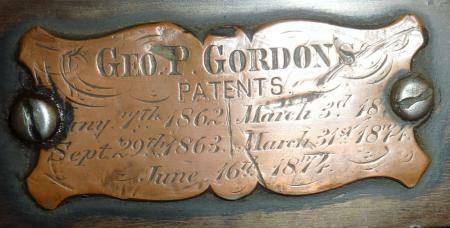 Who else has an original G. P. Gordon with an original treadle? Gordon began selling his original design about 1850, but he went through several designs, some more successful than others, and I’m not sure where this design fits into the chronology. It appears it is the basis for the subsequent “knock-offs”. Bob’s correct. Its a New Style Gordon made after 1860. This was the least desirable model compared to his original Old style. We have one in our collection with s/n 950. The # will be stamped on various parts of the machine. We guess ours to be ca. 1872. Nick, is there any way you can lead me to a high res version of that photo? That’s awesome. To me it looks like the treadle says CP, I assumed Chandler & Price. And what exactly is that, thing, inside the flywheel? 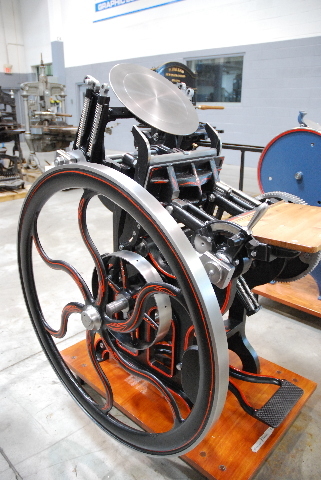 Mine is broken, but I still can’t figure out what its for from looking at photos of other presses. The Treadle does say C&P. It is off of a New Style Chandler and Price. OK, the monogram on the treadle doesn’t work — it’s a substitute. I thought it might be “GPG”. 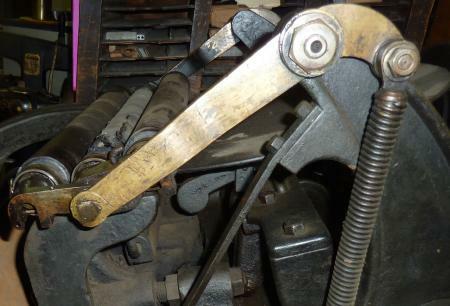 The “thing, inside the flywheel” is a counterweight that helps stop the flywheel and treadle in a position that allows you to restart the press just by stepping on the treadle. Gordon used it, as did Degener and a few other press builders - as far as I know C&P didn’t. Yours looks to be either damaged or it was a faulty casting that got sold. It should look like the one on Nick’s press. The ubiquitous Gordon Old Style, aka Gordon Jobber…an absolutely beautiful piece of early industrial age perfection! The throwoff lever and hefty interior bracing with the Gordon name on the press above lead me to believe that this is a later model than 1873, but most of my research has been limited to the 7x11 and this appears to be a larger press. Also, as stated above, all of this detective work is for naught if the original or subsequent owner(s) of the press made modifications to it. At any rate, she’s a beauty and I expect megahurt will be pleased with her after applying a little (but not too much) TLC. Nice find!! Also, I don’t have a chase, but I measured the bed and platen. I also have the same press in the 8 x 12 chase size. Same name plate and brass arm. I feel like the search for a chase and properly sized treadle are going to be a serious pain. Also, suggestions as to where to go for rollers for this press? And what exactly am I asking for (size, etc)? megahurt, chases are probably rare for this guy, I have made a few over the years out of wood, I use the plywood that cutting die makers use and it works very good, also I have ground down a few chases that were close to the size needed but this can be tricky. Uses the same chase as an 8” X 12” C&P. Same goes for the ink rollers. You should be able to use the existing treadle — even though it may not be original. For rollers and trucks, you can either get standard 8x12 C&P as suggested, or have new ones made — choose a core diameter and length that matches the saddles, measure the center-to-center distance between the saddle bearings and subtract a little, and that can be the diameter of both the rollers and the trucks. I think you should tell folks the CP logo is actually GP and keep the treadle you got with the press. The logo doesn’t bother me at all, but I think it’s too large. The press isn’t on wooden rails yet, and the treadle hits the floor. I think that’s fairly common even on the presses that treadle was made to fit. Chandler & Price really seem to have expected the press to be raised and since G.P. Gordon did the original design, it wouldn’t surprise me that his presses were the same. If you’re not intent on keeping it original, you could also shorten the hook a bit by bending the hook a bit further down (something a good blacksmith can easily do) — you probably only need to gain less than an inch. But depending on how tall you are you might want to raise the press a little anyway for more comfortable feeding.